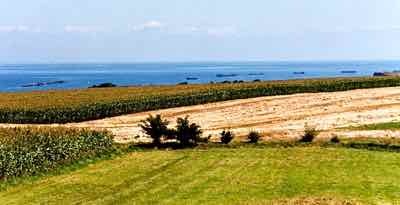 The Normandy beaches that are most famous... as least for historians... are the ones between Cherbourg and Le Havre. They are also known as the D-Day Invasion Beaches. The area is a special draw for those interested in the history of World War II. Americans, Canadian, English, and some French troops stormed these beaches on June 6th, 1944. On D-Day, the beaches were anything BUT peaceful. If you like history and airplanes, here is an event to plan a trip around…. In June 2019, the D-Day Squadron commemorates the 75th anniversary of D-Day, leading an American fleet of restored C-47 WWII aircraft in “Daks Over Normandy”, a flyover of more than 30 international aircraft to drop 250 paratroopers over the 1944 drop zones in Normandy. Should be pretty amazing. The British were assigned to Sword and Gold. The Americans landed at Omaha and Utah. The Canadian sector beach was Juno. The beaches are still known by these code names. The area is dotted with museums and reminders of that historic time. We went because both Mark's and my fathers had been there, and survived. We rented a car and did a drive through Normandy ourselves. If you want to follow our route, start your drive in the east of Normandy. Take Route 514 which winds its way up the coast past Juno and Gold beaches, the sites of the British and Canadian landings. These beaches slope gently up to the town. Visit the little town of Arromanches. This is where the British created a "prefab harbor" by sinking old ships and cement blocks called "Mulberries". You can still see the remains of some of this "temporary harbor" from the D-Day Landing Museum (Musee du Debarquement). Those little black dashes in the photo above are bits of that temprorary harbor. A similar barrier was built at Omaha Beach, but it was swept away within two weeks. 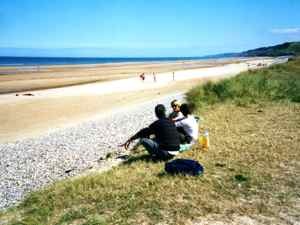 Continue on to Omaha Beach. Both Omaha and Utah beaches end in steep cliffs, which contributed to the great number of American casualties. 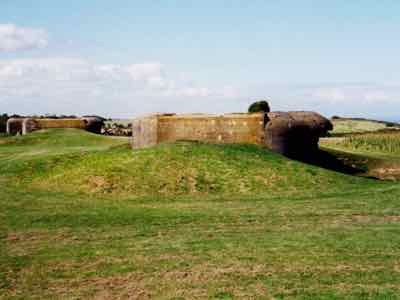 Ruins of the German bunkers above Omaha Beach are still in place. We've read that the French government says you can't picnic at the bunkers because they're considered grave sites. But walking that wide expanse of beach, now so peaceful, is an experience that will leave you reflecting on how freedom comes with a price. 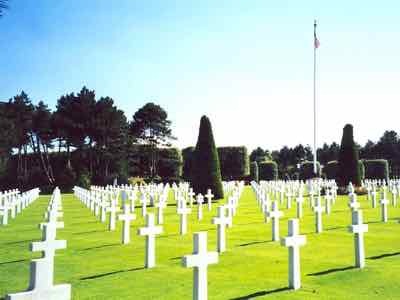 Continuing west, you will come the the US Military Cemetery at Colleville-sur-Mer. 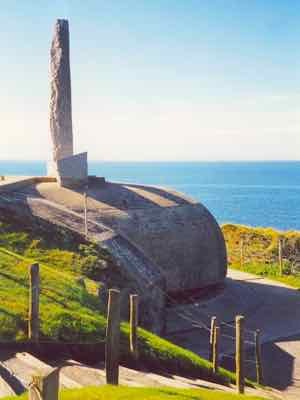 The Colleville memorial and cemetery overlooks Omaha beach, with a beautiful view of the English channel. If this expanse of peaceful green, with the rows and rows of white grave markers doesn't leave you misty eyed, nothing will. The last site you will come to is the Pointe du Hoc. This is where the US Army Rangers struggled to take the cliffs at such great cost. We think the best way to reach the Normandy Beaches is to get a rental car and drive from Paris like we did. There are signposts all along the roads directing you to the different beaches and museums. Visits to the area can be arranged in Paris... You can even do it as a day trip, but we think that would be rushed. There are small inns and B&Bs to stay at the towns along the beaches, and even some grander "manor houses" that have been turned into hotels. You could choose to stay at an inland base for a couple of days at Caen or Bayeux. There are several museums in the area. There is also a Memorial for Peace in Caen. It is sometimes called the Peace Museum. If you really want to get an overview of the entire invasion, you might want to start here instead of rushing right to the beaches. They organize day trips to the beaches with a guide. If you just want to wander the beaches and reflect, you can do that too. All of the Normandy beaches look so peaceful that it's hard to imagine what it must have been like on D-Day.